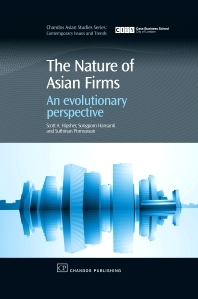 The Asian business environment; The evolution of Asian firms; The nature of Asian firms; The evolution of individual Asian firms; The Asia-Pacific century; Diversity in Asian business practices; Continued evolution of Asian firms. The Nature of Asian Firms provides managers and others interested in doing business in the dynamic and fast changing Asian region with an understanding of the underlying principles driving both current and future business practices of Asian firms. The book is for internationally focused individuals who realize the importance of gaining a deeper understanding of the fastest growing economic region in the world and the firms from this region. Scott A. Hipsher has extensive experience living, working and researching in developing economies in Asia. He is currently working in Henan Province. His published works include Business Practices in Southeast Asia: An Interdisciplinary Analysis of Theravada Buddhist Countries, various book chapters, academic journal articles, newspaper and magazine articles, as well as a number of blogs and internet articles. Dr Songporn Hansanti is Director of Foreign Affairs in the Faculty of Management Sciences at Kasetsart University in Bangkok Thailand. Dr Suthinan Pornsuwan is an associate professor and the Dean of the International College at Bangkok University.